It's the new year and it's usually the time we itch to take a change. If we're smart, we're going to take chance and take advantage of this sudden burst of courage brought on by the newly minted year. Not feeling too courageous? I understand. There is nothing scarier than the unknown.. But, honey, it can be so rewarding. I promise you! So, allow me to take your hand and ease you in a little into 2016! Yes! Dear momma Shen is giving you a chance to take a small step towards your very own Modern Filipina Transformation because I am giving away tickets to the biggest event Creamsilk is launching with celebrate us, Modern Filipinas in partnership with Philippine's premiere magazine, Creamsilk Transformations: Spotlight on Modern Filipinas. On January 23, 2017, it's going to a fun-filled event that Creamsilk has prepared for you. You'll have a chance to try a lot of workshops that can spark that transformation you've been dreaming off and of course, Creamsilk will take care of you as you embark on a new journey with your Creamsilk Daily Treatment Conditioner with a hair makeover! Creamsilk, being the no. 1 hair conditioner in the Philippines, understands the need of every Filipina and how vital it is to be a master of your own destiny, this event will mark their support and love for the newly transformed you. Mark your calendars, January 23, 2015, 2PM at the World Trade Center tent. 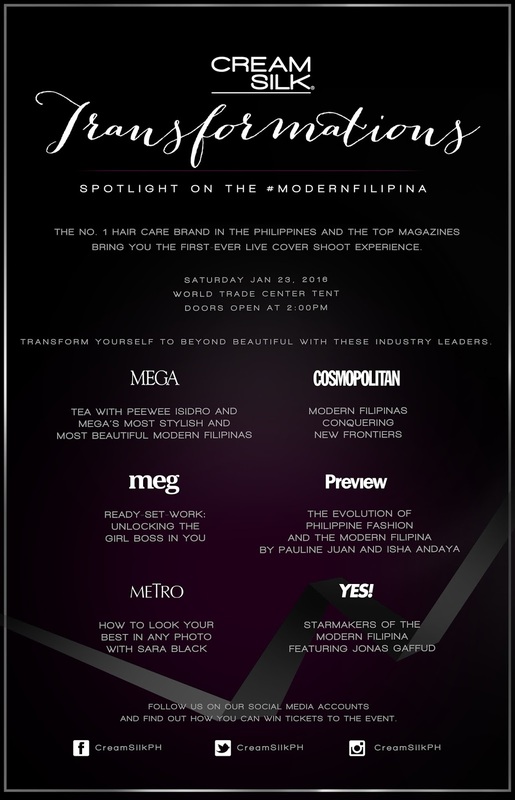 Join us as we celebrate the transformation of the Modern Filipina. Want to win VIP access to Cream Silk’s event? Simply complete the phrase “This 2016, I will become a #ModernFilipina by ________ @CreamSilkPh #CreamSilkTransformations”, post this on your social media accounts and @CreamSilkPh will be picking 60 lucky winners to attend the event!